ZagTrader, a specialized financial technology provider serving the Brokerage, Investment Banking, Asset Management, and the Digital Assets Exchanges community, has formally announced today the expansion of the Crypto Exchange destinations it covers on its platform, which now supports over 130 Crypto Exchanges from its previous 90 exchange list. The supported exchanges by ZagTrader allows institutions to receive real-time data feeds (Level 1 and Level 2), route orders, and synchronize balances and positions when applicable under one centralized environment. 1broker, _1btcxe, acx, allcoin, anxpro, anybits, bcex, bibox, bigone, binance, bit2c, bitbank, bitbay, bitfinex, bitfinex2, bitflyer, bitforex, bithumb, bitibu, bitkk, bitlish, bitmarket, bitmex, bitsane, bitso, bitstamp, bitstamp1, bittrex, bitz, bl3p, bleutrade, braziliex, btcalpha, btcbox, btcchina, btcexchange, btcmarkets, btctradeim, btctradeua, btcturk, btcx, bxinth, ccex, cex, chbtc, chilebit, cobinhood, coinbase, coinbaseprime, coinbasepro, coincheck, coinegg, coinex, coinfalcon, coinfloor, coingi, coinmate, coinnest, coinone, coinsecure, coinspot, cointiger, coolcoin, crypton, cryptopia, deribit, dsx, ethfinex, exmo, exx, fcoin, flowbtc, foxbit, fybse, fybsg, gatecoin, gateio, gdax, gemini, getbtc, hadax, hitbtc, hitbtc2, huobi, huobicny, huobipro, ice3x, independentreserve, indodax, itbit, jubi, kraken, kucoin, kuna, lakebtc, lbank, liqui, liquid, livecoin, luno, lykke, mercado, mixcoins, negociecoins, nova, okcoincny, okcoinusd, okex, paymium, poloniex, qryptos, quadrigacx, quoinex, rightbtc, southxchange, surbitcoin, theocean, therock, tidebit, tidex, uex, urdubit, vaultoro, vbtc, virwox, wex, xbtce, yobit, yunbi, zaif, zb. Headquartered in Dubai since 2009 with a large development and support offices and business partner’s network across the globe. ZagTrader is a leading technology company specialized in global financial services industry including banking and capital markets. 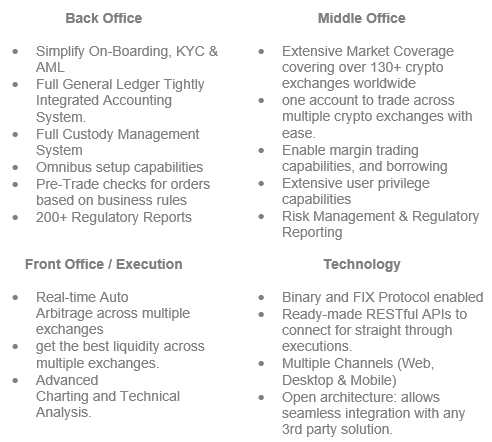 ZagTrader provides a world-class end-to-end integrated trading platform to serve its clients from banks and financial institutions with agility and innovation. Copyright © 2018 ZagTrader.com, All rights reserved.